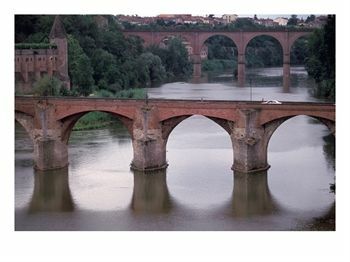 Historic Towns in the Languedoc-Roussillon: Albi in the Languedoc. Albi is an attractive Market town with a Spectacular Cathedral. Along with Toulouse and Montauban, Albi is one of the main cities built in Languedoc brick - essentially the style of ancient Roman bricks. Albi is the capital (préfecture) of the Tarn département, and is located on the Tarn River, 50 miles northeast of Toulouse. Its inhabitants are called Albigeois (m) or Albigeoises(f). The first known human settlement in Albi dates from the Bronze Age, but little remains from this period. After the Roman conquest of Gaul in 51 BC, the town became "Civitas Albigensium", the territory of the Albigeois, "Albiga". Archaeological digs have not revealed any traces of Roman buildings, suggesting that Albiga must have been a modest Romans settlement. In 1035 - 1040, a bridge now known as the Pont Vieux (Old Bridge) was built. The city grew rich at this time, a result of the trade that the bridge brought, and also to the tolls charged for crossing it. The Pont Vieux is still in use today. Originally built in stone), then clad with brick, it rests on 8 arches and is 151m long. In the 14th century, it was fortified and provided with a drawbridge. Houses were built over the piers. Albi gave its name to a religious group more commonly known as the Cathars. The Roman Catholic authorities seem to have believed, mistakenly, that Albi was the religion's centre in the Languedoc and so called Cathar believers Albigoise or Albigensians. When Pope Innocent II launched a war on the people of the Languedoc and their rulers, including the Viscounts of Albi, it came to be known as the Albigensian Crusade. From 1450 to 1560, Albi enjoyed a period of prosperity largely due to the cultivation of Isatis Tinctoria a dark blue dye known in French as pastel, in English as woad and in Occitan as Cocanha. This was the original Land of cocanha, or Land of Cocaigne. Renaissance town houses in Albi of the bear witness to the fortunes amassed by the cocanha merchants. An historic area built around the cathedral and episcopal buildings covers 63 hectares. Red brick and tiles are the main feature of most of the buildings. Albi was the birthplace of Henri de Toulouse-Lautrec (1864–1901). Today it is the home of the Toulouse-Lautrec Museum. More than 1000 works, including the 31 famous posters, are kept here. This body of work forms the largest public collection in the world devoted to Toulouse-Lautrec. a 78 m high bell tower the Baldaquin over the entrance (1515–1540). The central choir (chœur), reserved for members of religious orders is separated from ordinary mortals in the nave by a stone rood screen. The rood screen in the Gothic style, decorated with statuary carved by artists from the workshops of Cluny and comprising over 200 statues which have retained their original colours. Below the organ, a fresco of the Last Judgement, attributed to unknown flemish painters, originally covered nearly 200 square meters (the central area was later removed). The frescoes on the enormous vaulted ceiling comprise the largest and oldest ensemble of Italian Renaissance painting in France. The elaborate interior stands in stark contrast to the cathedral's military exterior. The Palais de la Berbie, formerly the Bishops' Palace of Albi, is now the Toulouse-Lautrec Museum. Its name comes from the Occitan word Bisbia, meaning Bishops' Palace. It is one of the oldest and best-preserved castles in France. It was completed at the end of the 13th century. Albi is known in France for its elite Lycée Lapérouse, a high school with 500 students situated inside an old monastery. Hôtel Reynès : hôtel d'art Renaissance construit en 1520 par un marchand de pastel du nom de Reynès. L'hôtel contient une cour construite en brique et pierre et bordée par une loggia et des sculptures de François Ier et de sa seconde épouse, Éléonore d'Autriche. C'est aujourd'hui le siège de la chambre de commerce et d'industrie. Henri de Toulouse-Lautrec was a native of Albi. His full name was Henri Marie Raymond de Toulouse-Lautrec Monfa. He was born on 24th November, 1864, the first child of Comte Alphonse and Comtesse Adèle de Toulouse-Lautrec. The Count and Countess were first cousins, and Henri suffered from congenital health conditions attributed to this and other family inbreeding. A younger brother was born on August 28, 1867, but died the following year. At the age of 13 Henri fractured his left thigh bone, and a year later his right one. The breaks did not heal properly and his legs stopped growing. As an adult he stood 1.52 m or 5 ft tall, having developed an adult-sized torso but retaining child-sized legs. Unable to participate in most of the activities enjoyed by his peers, Toulouse-Lautrec immersed himself in art. His mother took him to Paris where he entered professional teaching studios in 1882. He settled in Montmartre in 1884. His immersion in the decadent and theatrical life of fin de siècle Paris yielded an oeuvre of provocative images of modern life. His wit attracted a artists and intellectuals, including Oscar Wilde and Vincent van Gogh. He studied with French academic painters L. J. F. Bonnat and Fernand Cormon. He became an important post-Impressionist painter, art nouveau illustrator, and lithographer and recorded in his works many details of the late-19th century bohemian lifestyle in Paris. Lautrec met Edgar Degas who provided encouragement and some of Lautrec’s lithographs reveal his debt to the older artist. His oeuvre includes paintings, drawings, etchings, lithographs, and posters, as well as illustrations for various contemporary newspapers. He incorporated into his own individual method elements of the styles of other contemporary artists, especially Degas and Paul Gauguin. Japanese art influenced his use of oblique angles, sharp delineation and flat areas of colour. His work inspired van Gogh, Georges Seurat, and Georges Rouault. Outstanding examples of his work are La Goulou Entering the Moulin Rouge (1892, Musée Toulouse-Lautrec, Albi), Jane Avril Entering the Moulin Rouge (1892, Courtauld Gallery, London), and Au salon de la rue des Moulins (1894, Musée Toulouse-Lautrec). He was acclaimed as "The soul of Montmartre", the Parisian quarter where he made his home, frequenting the circus, the theater, and local brothels. He portrayed life at the Moulin Rouge and other Montmartre and Parisian nightspots. He lived in a brothel for long periods. He painted singer Yvette Guilbert, Louise Weber (La Goulue) a dancer who created the "French Can-Can", and the dancer Jane Avril. Toulouse-Lautrec gave painting lessons to Suzanne Valadon, one of his models. By the 1890s he had become a leading figure in the Parisian art world. The largest exhibition of his work during his lifetime was held at London’s Goupil Gallery in 1898. An alcoholic for most of his adult life, in the 1890s he began to drink even more heavily and was placed in a sanatorium. He died from complications due to alcoholism and syphilis on 9th September 1901 aged 36, at the family estate in Malromé. He is buried in Verdelais, in the Gironde, a few kilometres from his birthplace. He predeceased his father and so never inherited the family title. After his death, his mother, the Comtesse Adèle Toulouse-Lautrec, and Maurice Joyant, his art dealer, promoted his art. His mother contributed funds for a museum to be built in Albi to house his works. Today he one of the most famous artist in the world, his paintings selling for tens and hundreds of millions. The invention of a cocktail known as the Tremblement de Terre (Earthquake) is attributed to Toulouse-Lautrec. It contains four parts Absinthe, two parts Red Wine, and a dash of Cognac. Albi is an Roman Catholic Archdiocese, corresponding to the Department of the Tarn. It became an archiepiscopal see in 1678, was dissolved during the French Revolution and re-established until 1822, when it was united Bishopric of Castres. A local tradition attributes the foundation of the see to an African St. Clarus, who was later martyred. Like almost all stories of this type it is entirely fictitious and dates from the twelfth century. A more reliable story is that in the fifth century, Eugene, a bishop from Carthage, founded the first monastery of the Gauls here. From the sixth to the eighth centuries, two families of Albi produced a series of saints, the Salvia family (St. Desiderius, St. Disciola) and the Ansbertina family (St. Goéric, St. Sigisbald, and St. Sigolina). The parish church of Lautrec is said to have been founded in the time of Charlemagne. Dominic Guzman (later Saint Dominic) operated here, organising the extermination of Catharism, a popular rival faith. He is still remembered here with a broad range of levels of affection. In the vicinity of Castres there is a natural grotto containing several chambers called the grotto of St. Dominic. According to tradition it was used as Guzman's retreat. The Catholic Church Council of Albi in 1254 organised the Inquisition in the region. As elsewhere it was largely manned by Gusman's Dominical Order, and was charged with the task of completing the extermination of the Cathars.